This film is an authentic dialogue between Joel Kramer of Living Hope Ministries (producer of www.SourceFlix.com) and LDS Greg Gifford. The setting is filmed entirely in Israel. The film attempts to demonstrate how the Bible has all sorts of evidence for it whereas the Mormon scriptures have none, and even have significant evidence against them. The film demonstrates the Bible being the best attested work of antiquity. The Dead Sea Scrolls date to around a couple centuries before Christ, and these scrolls together with other texts centuries after Christ confirm that the Old Testament has remained virtually the same. As for the New Testament, there are thousands of copies, and variations would stick out like sore thumbs. Yet no changes to the New Testament are detrimental to its substance. The Bible gives a test for a prophet, and it is found in Deuteronomy 18:21-2. It says that if the prophet screws up just once in foretelling something in the name of God, then that prophet cannot be a prophet of God. Only God perfectly knows the future. So if He uses a prophet to tell His word, then that prophet will consistently get it right. The Bible gets it right when it prophesies Jesus Christ’s birthplace, His family lineage, the form of His execution, Jerusalem and its temple being destroyed after His death, as well as His resurrection. These various events were confirmed both in and outside the New Testament. The film next applies the test of a prophet to Mormon scriptures. The Book of Mormon in 1 Nephi 13-14 claims the great abominable church Satan led would remove plain and precious truths from the Bible after the time of the 12 apostles. Nephi obviously failed as a prophet in this matter (for more on this, see here). The film also tests the prophet Alma, who claimed that Jesus would be born at Jerusalem (Alma 7:10). This would entail that Alma was a false prophet, since Jesus was actually born at Bethlehem. The film then tests Joseph Smith when he prophesied that a temple would be built in Independence, Missouri in his generation (D&C 84:1-5). The problem is that a temple was never built there. The film finally tests Smith as a translator. The Book of Mormon as well as Smith’s translation of Isaiah contains identical wording that is not found in any Hebrew manuscripts of the Bible. Further, there are no Greek manuscripts that confirm Smith’s translation of John 1:1 and Romans 4:16. In all cases, the meaning is radically changed. The cinematography is Kramer’s best work. He does a great job capturing the various archeological sites. Kramer nicely uses contemporary scholars and early historians (Eusebius and Josephus) to buttress his arguments. As for the former, he utilizes Dr. Christophe Rico (linguist) and Dr. Randall Price (Qumran archeologist) for biblical manuscript evidence, Todd Bolen (historical geographer) and Jewish Dr. Gabriel Barkay (archeologist) for verifying the location of Jesus’ birth, secular archeologist Dr. Shimon Gibson for confirming the location of Jesus’ tomb, and Dr. William Lane Craig for confirming Jesus’ resurrection. Though the evidence comes across as overwhelming, Kramer does a great job at being irenic. He lets the evidence do the convicting while showing Gifford a tremendous amount of gentleness and respect. It is important for others to see how a genuine and average LDS guy like Gifford responds to all the evidence presented. He exhibits obvious mental turmoil when faced with the facts. It is important for the viewer to understand conversion as a process; one may know the truth, and still not be converted. One plants, one waters, but God gives the increase as 1 Corinthians 3:6-7 indicate. God is the one that ultimately must convert an individual in His timing. Though the use of Gifford in this film is a positive in certain respects, it also struck me as a negative. Gifford comes across as a marshmallow, who does not give much of a fight for his faith. This leaves the unsuspecting viewer unaware of the various arguments that LDS apologists use to defend their faith. The film makes the viewer think that if one simply utilizes these arguments, then the LDS person will naturally have no response. There are two specific problems I have in mind. The first problem concerns Alma 7:10. The passage says that Jesus would be born at Jerusalem, which is the land of our forefathers. Though the film made mention of LDS apologists Daniel Peterson and Kerry Shirts claiming the proximity of Bethlehem to Jerusalem, this is not the end of the issue as far as LDS are concerned. Simply because Bolen says that he is unaware of any reference to Jesus being born in the land of Jerusalem does not settle the issue. Bolen is a scholar of the Old World. He presumably is not a scholar for the New World. Is it possible that Jews far removed from Jerusalem used to speak this way in some New World setting? Of course it is. So it would have been more convincing to talk to ancient New World scholars to confirm that no language group known would have ever talked this way. There is no evidence, though, that there were any ancient Native Americans talking about Jerusalem or Bethlehem (this is basically what Kramer does in his video DNA vs. the Book of Mormon). But again, this does not rule out the possibility of some lost ancient Israelites in America (confirmed outside the Book of Mormon), who used to talk this way. Furthermore, LDS apologists take issue with Bolen and cite references from the Old World where the phrase "land of Jerusalem" is used. For more on this, see here. The second problem concerns Smith’s prophecy of the building of the temple in Independence, Missouri in Smith’s generation. Kramer does not alert the viewer to ways in which other LDS generally deal with this problem. He gives the testimony of one former follower of Smith, Paul Trask, who concluded from this and other failed prophecies that Smith must have been a false prophet. Kramer also gives a statement from Apostle Orson Pratt who said in 1870 that LDS all understood that God would keep His promise in soon bringing about the building of the temple in this generation. So how do LDS generally respond? They claim that even though Pratt was an apostle, apostles still have their opinions in which they may be wrong. Not everything they say must be taken as the word of God. The only statements taken to be the word of God are those in which they claim to speak for God. LDS next point to Jesus also claiming that “this generation will not pass away until all these things be fulfilled” (Mt. 24:34). Jesus’ generation also came and went without His prophecies being fulfilled. So if Jesus can get away with this, then so can Smith. I think there is an answer to this that upholds Jesus and confirms Smith being a false prophet (for more on this issue, see here), but that is not my point here. The point is simply that the issue is much more complicated than the film lets on. Stylistically, I found the music that ran throughout the film to be sleepy, monotonous, and bordering on tedious. It was beautiful, but it was too much of a good thing. The film was also slow moving and dragging in parts. This is still an important work that everyone needs to see. Even those who have no interest in Mormonism will come away with a new appreciation for the Bible. 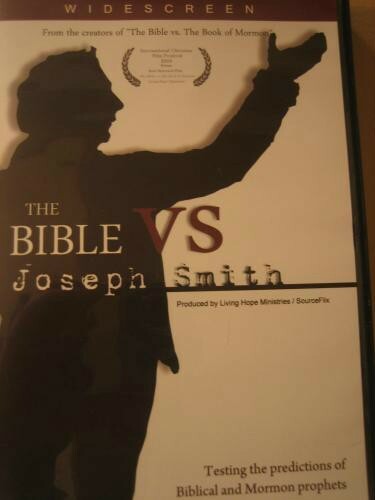 For information on how to order a copy of The Bible vs. Joseph Smith, please visit here, and to watch the film, please visit here.